One of the latest games that I was incredibly excited about playing was Nightfall . 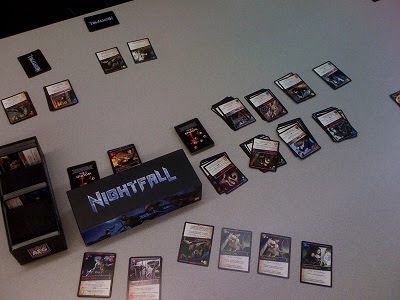 Nightfall is a deck building game (think Dominion and Thunderstone ), but with several innovations. To start a game of Nightfall, each player is dealt 4 "draft" cards. From these draft cards, they select a card and pass the rest, select a card and pass (again), and then select a card for the "common" pile (the fourth card is discarded). Using the first two cards that they selected, they form 2 "archives" (piles) from which only they can purchase cards (there are also 8 "common" archives from which all the players can acquire cards). After this happens, the game actually begins. On any given turn, a player first must attack the other players with his minions in play (another new element to deck building games). After this, they can play new cards (actions and minions) by forming a "chain" of similar colors (yet another innovation). Finally, they are able to purchase new cards and draw their hand back up to 5. The game is over once the "wound" pile is depleted, at which point whoever has the least number of wounds is the winner. There are a lot of pros for this game (especially because I'm a sucker for innovations in games), so here we go. First off, I really like the chain system. How it works is that each card has a primary color (a large moon), and one or two secondary colors (smaller moons next to the large moon). There is also potentially a "kicker" (large moon at the bottom of the card), but I won't go into that. In order to play cards, you form a "chain". First you play any card. Next, you play a card that's primary color matches one of the previous card's secondary colors. You continue this process until you are content with the chain you have built (or just can't play any more cards). Now, each other player can build onto your chain in turn order. After the chain is completed, all of the cards are resolved in the opposite order in which they were played (last in, first out). This is a really interesting mechanic and adds a lot of strategic decisions to the game. Should you focus on a few colors so that all of your cards work well together? Should you try to get all of the different colors to increase your chances of being able to build on another player's chain? How many of a certain card should you buy, since you will need to be able to chain it with other cards in order to play them. Should I play on the chain that you built, or wait until my (or a different player's) turn? This mechanic is excellently implemented. Secondly, I really like the draft system. I love that you have certain cards that are only available to you and that you also have input on which cards are (and are not) used in the common piles. This is especially important and strategic because of the chaining; if you do not plan ahead when drafting cards, you will select cards that do not work well together and wind up shooting yourself in the foot to start the game. At first, I thought that this aspect of the game needed to be more prominent, but the more I played, the more I liked that it gave you just enough control that you were able to help flush out a strategy (which is incredibly important, because Nightfall forces you to be much more diligent with your deck building than most other deck building games - if you don't select cards that work together, your chain will never consist of more than one or two cards). Overall, I think I've completely fallen in love with this draft mechanic and may start using it when I play other deck building games (though, again, without the chain it will be less impactful). The third thing that I loved about Nightfall is how the "wound" cards worked. When first reading through the rules, this was truly my main concern. I thought to myself "with the number of wounds that you're bound to receive, your deck will get watered down and won't be able to function worth a flip." (Yes, I recorded my thoughts... isn't that normal? "Yes, that's normal." Thanks, self. Anyway, I digress....) Fortunately, wound cards are actually somewhat useful. At the end of your turn, after you draw back up to 5 cards, you are allowed to execute a single "wound effect". In the base game, this wound effect is that you can discard all of the wounds in your hand and draw two cards for each wound discarded. Yes, this means wounds actually help you have a better hand. That is awesome, as it means that there is actually a strategic option of allowing wounds to be received early in the game to enhance your ability to draw. Unfortunately, I must admit that there were a few downsides to the game. The first one was that the cards are very busy when first learning the game. A normal card may have 4 different colors on it, and you must remember what each color is for. There are also two different numbers on the minions that are differentiated by color and location on the card. This causes there to be a decent number of "whoops" moments when players are first learning the game as they get colors mixed up or forget how certain elements work. This all resolves itself after the first few plays, however, so I didn't think it was a major drawback. The second con, and the one that I think bothers me more, is that after a few times playing through the game the first several rounds all feel the same. I do not know if other people wind up with this experience, but after about our second game, we all played our first 2-3 turns exactly the same. (Specifically, there is a card that gains you two extra "influence" on your turn (the currency that you use to buy cards), but only if it is in "your chain". We wound up all playing this card as our chain and then nobody would build on the active player's chain (no sense, since it would not be "your chain"). Next, the active player would discard everything else to buy cards.) I wish that there were some way to mix this up more. To be fair, I am willing to concede that this may be that we are just all incredibly unimaginative on other strategies that might work better than the one we came up with. Overall, I give Nightfall a 9.0/10. I would highly recommend that anybody who enjoys deck building games try this one out. We wound up playing back to back games in a rapid succession that I haven't done with a deck builder since first trying Dominion. In all honesty, this game left me already looking for the expansion so that I can play it even more - but don't worry, we're not done playing through the one we have. I would like to thank AEG for providing me a demo copy of Nightfall to review. Nice review of a very new game! So how do you tell whose cards are whose when detangling a big chain if all the backs are the same? Thanks! We handled it by each building our segment of the chain in front of us. I think you could also do it by building the chain in the middle and spinning your cards towards yourself. Nice review! I'm still on the fence about the whole thing - I'm also deckbuilded out. But I like what AEG does with most of their games, and the mechanics seem intriguing. Hopefully I'll get to try it out soon! When I first heard about deck building games I was not interested at all until I tried Dominion and got absolutely hooked. A few weeks ago I had then the opportunity to play Thunderstone and found it horribly dull. My expectations for Nightfall are mixed but I'm slightly inclined to believe it's a great game. This looks like fun. How long does it take to play a game? Work perhaps?